Limited Edition Milwaukee Para Con Print from Muddy Water Press! Holy smokes! Alex Groh of Muddy Water Press has designed this gorgeous, 4-color, limited edition, screenprinted Milwaukee Para Con poster! You can order them online and he’ll also be tabling on the vendor floor. He will generously be donating 15% of sales of this poster toward con costs. 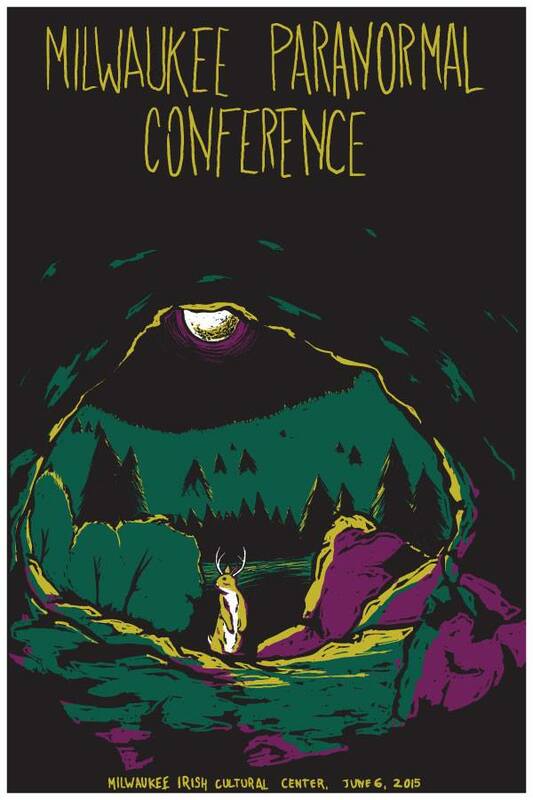 I am going to tell all of you some sage words, here: you can’t go wrong with artwork featuring a jackalope in it! The Forest Home Cemetery is a park-like oasis on the south side of Milwaukee. Here, one can take winding paths over gentle hills, reading history in the gravestones. The Victorian landscape includes many ornate statues, crypts and monuments, as well as over 300 species of trees. Those who are buried here tell the history of Milwaukee — the social elite and gangsters, anarchists and laborers, victims of epidemics and fires, the notorious and the unknown. The Forest Home Cemetery was established in 1850. It began with 72 acres, located on land that was once an Indian village as well as a sacred effigy and burial mound site. The first burial in the new cemetery took place on August 5, 1850, when a man named Orville Cadwell was laid to rest. He was soon joined by the victims of a cholera outbreak. In 1883, a fire broke out at Milwaukee’s Newhall House Hotel. City fire fighters were actually battling a blaze elsewhere at the time, and calls for help were made to Chicago and Racine, without success. The number of victims remains uncertain. Documents from that time list the death toll as ranging from 73 to 90. More than half of the victims were burned beyond recognition. Sixty-four of the victims are buried in a mass grave in Forest Home Cemetery. By the turn of the century, the cemetery grew to 200 acres. The elite — the political figures and the wheat and beer barons — built unique monuments and family crypts in Forest Home Cemetery. One of the most notable monuments is the Gothic-style Landmark Chapel, constructed of dark red sandstone from Lake Superior. Today, the cemetery includes the Halls of History, which is an indoor mausoleum and community center that includes exhibits about the history of Milwaukee. Adjacent to this is the outdoor Chapel Gardens mausoleum, with ornate statues and rose gardens. There are over 110,000 burials in Forest Home Cemetery today, including 28 Milwaukee mayors, 7 Wisconsin governors and many famous industrialists. Not surprisingly, Forest Home Cemetery is reputed to be one of the most haunted cemeteries in Wisconsin., and yet it is difficult to find witness accounts of paranormal experiences from visitors to the cemetery. One theory concerns an ongoing rivalry between the beer barons, Valentin Blatz and Johann Braun, who are buried there. The two were rivals in life. In 1850, Blatz opened a brewery next to Braun’s brewery. When Braun died in 1852, Blatz took over Braun’s brewery. Then, to top it off, he married Braun’s widow! For several months in the 1970s, I lived directly across the street from the cemetery. I often took advantage of this peaceful haven in the midst of the busy city, enjoying the serenity and beauty of the cemetery. But there was one section on the north side of the cemetery that “just wasn’t right,” and I avoided it without quite knowing why. Even in the bright sunshine, it felt dark. Years later, I learned that others have reported experiencing the same unease in that section of the cemetery, but I have yet to find an explanation. If you know of the story behind the north section of the cemetery, either related to the history or to any possible paranormal activity, I hope you will write in and share this information. I grew up rural Wisconsin, on the edge of what is now a wildlife preserve, a section of which was a Native American settlement and burial ground. I spent a great deal of time exploring the woods and marsh. As a child, I was keenly aware that I wasn’t alone when exploring the preserve, but while sometimes sensing a very strong presence, I felt no fear. I’ve always been intrigued by both the folklore and the modern accounts of those things that we can’t quite explain, and tend to discuss only in quiet evenings spent with family and our closest friends. My goal here is to gather, organize and share information about the paranormal, most specifically related to Wisconsin hauntings, in the effort to encourage further exploration and, hopefully, a better understanding of this aspect of life. Have you encountered a Wisconsin ghost? Please share your experience and/or thoughts about Wisconsin ghosts!